Flavolipin, an amino acid-containing lipid isolated from Flavobacterium meningosepticum, induces many immune responses. It has been shown that flavolipin does not induce an immune response of macrophages derived from C3H/HeJ mice, which possess a point mutation in Toll-like receptor 4 (TLR4). To determine whether TLR4 or the molecular complex of TLR4 and TLR4 association molecule MD-2 mediates the flavolipin signal, flavolipin responsiveness was examined by measuring NF-κB activation in Ba/F3 cells and Ba/F3 transfectants expressing TLR4 or both TLR4 and MD-2. Flavolipin-induced NF-κB activation was detected in the cells expressing both TLR4 and MD-2, but not in the other cells. Expression of CD14 in the transfectant expressing both TLR4 and MD-2 increased the sensitivity to flavolipin. Furthermore, flavolipin stereoisomers were chemically synthesized, and their abilities to induce NF-κB activation were examined. (R)-Flavolipin, in which the configuration of the lipid moiety is R, induced NF-κB activation via the TLR4-MD-2 complex, but (S)-flavolipin did not. In this study, we demonstrated the involvement of TLR4-MD-2 and CD14 in flavolipin signaling and the importance of the (R)-configuration of the flavolipin lipid moiety for the induction of an immune response via TLR4-MD-2. Flavolipin is an amino acid-containing lipid, the structure of which comprises amino acid and lipid moieties (Fig. 1⇓) (1, 2). Amino acid-containing lipids, including ornithine-containing and glycine-containing lipids, are present in many Gram-negative bacteria, such as Bordetella pertussis (3), Pseudomonas aeruginosa (4), Achromobacter xylosoxidans (5), and Cytophaga johnsonae (6). Flavolipin, which contains serine and glycine (Fig. 1⇓), is unique to Flavobacterium spp. and comprises ∼20% of the cellular lipids of Flavobacterium meningosepticum (1, 7). F. meningosepticum is an opportunistic pathogen that causes pneumonia, meningitis, and septicemia in immunocompromised individuals, such as newborn infants and patients with advanced HIV disease (8, 9, 10, 11). Flavolipin has been shown to induce inflammatory immune responses, such as PGE2, IL-1β, and TNF-α production, by macrophages (12). The cellular receptor and signaling molecules for flavolipin have not been characterized well, and the essential moiety of flavolipin for the induction of an immune response has not been determined yet. The signaling events by which flavolipin induces the production of inflammatory cytokines are suggested to be shared, at least in part, by that of LPS because flavolipin does not induce cytokine production by macrophages derived from LPS-hyporesponsive mutant mice, C3H/HeJ (12). The lps gene, which is responsible for the LPS hyporesponsiveness in C3H/HeJ mice, was recently mapped to Toll-like receptor 4 (TLR4)3 (13, 14). TLRs constitute a mammalian transmembrane protein family and are similar to Drosophila Toll (15) in that they have extracellular domains containing leucine-rich repeats and a cytoplasmic portion homologous to the intracellular signaling domain of the type 1 IL-1R (16, 17). Drosophila Toll and mammalian TLRs have been shown to play crucial roles in innate immune responses, such as antimicrobial peptide production (15), inflammatory cytokine production (16), and NF-κB activation (16). TLR4 from C3H/HeJ mice has a point mutation that causes a failure to activate NF-κB (18). Subsequently, using the generated TLR4-deficient mice, TLR4 was unequivocally demonstrated to be involved in the LPS response (18). However, the expression of TLR4 is not sufficient to confer LPS responsiveness on the human embryonic kidney 293 cell line (19) or mouse pro-B cell line Ba/F3 (20), implying a lack of factor(s) in cells expressing TLR4. Expression of MD-2, a molecule that physically associates with TLR4 on the cell surface, with TLR4 has been demonstrated to confer LPS responsiveness on Ba/F3 cells (20) and human embryonic kidney 293 cells (21). Furthermore, expression of CD14, which has been identified as a cell surface receptor for LPS (22), enhanced the LPS signal mediated by the TLR4-MD-2 complex (23). In addition, it was demonstrated that MD-2 is also required for the TLR4-mediated signaling induced by Taxol, which mimics the action of LPS on murine macrophages (21, 24). These findings suggest that the TLR4-MD-2 complex is a key surveillance molecular complex as to microbial infections. In this study, we show that the flavolipin signal is mediated by the TLR4-MD-2 complex. In addition, we show that the (R)-configuration of the lipid moiety in flavolipin is essential for induction of the signals mediated by the TLR4-MD-2 complex. RPMI 1640, Taxol prepared from Taxus brevifolia, phospholipase A2 prepared from porcine pancreas, and triethylamine (TEA) were purchased from Sigma-Aldrich (St. Louis, MO). Ham’s F-12 medium was purchased from Life Technologies (Gaithersburg, MD). LPS prepared from Escherichia coli 0111:B4 was purchased from List Biological Laboratories (Campbell, CA). Anti-CD14 mAbs (rmC5-3) were purchased from BD PharMingen (San Diego, CA). Deoxycholic acid (DOC) was purchased from Difco (Detroit, MI). Flavolipin stereoisomers, N-(S or R)-[3-(isopentadecanoyloxy)isoheptadecanoyl]-glycyl-(l or d)-serine ((S or R)-lipid-Gly-(l or d)-Ser), and flavolipin analogs, N-(S or R)-[3-(isopentadecanoyloxy)isoheptadecanoyl]-(l or d)-serine ((S or R)-lipid-(l or d)-Ser) and N-(S or R)-[3-(isopentadecanoyloxy)isoheptadecanoyl]-seryl-(l or d)-glycine ((S or R)-lipid-(l or d)-Ser-Gly), were synthesized as described previously (2) and dissolved in DMSO. All other chemicals used were of reagent grade or better. Flavolipin was prepared from F. meningosepticum by the method reported previously (1) with slight modifications. F. meningosepticum was grown on heart infusion agar (Eiken, Tokyo, Japan), and the cellular lipids were extracted from it according to the method of Bligh and Dyer (25). Flavolipin was separated from the other extracted lipids by TLC on a silica gel 60 plate (Merck, West Point, PA) using chloroform-methanol-water (65:25:4, v/v) as the solvent system, and flavolipin was extracted from the silica gel according to the method of Bligh and Dyer (25). Flavolipin prepared by the TLC procedure was treated with phospholipase A2 (1 × 103 U/ml) at 37°C for 3 h to remove contaminating phospholipids, such as phosphatidylethanolamine. To purify the flavolipin further, the flavolipin treated with phospholipase A2 was purified by TLC using chloroform/methanol/acetic acid (65/25/10) as the solvent system. Finally, 69.9 mg of purified flavolipin were obtained from 80.7 g of F. meningosepticum cells. The purified flavolipin gave a single spot on staining with iodine vapor after two-dimensional TLC with chloroform-methanol-water (65:25:4) as the first solvent system and chloroform-methanol-acetic acid (65:25:10) as the second solvent system. Just before use, flavolipin was suspended in medium containing 0.2% TEA and 0.5% DOC by sonication. LPS contamination of the flavolipin preparation was measured with an Endospec ES test TE (Seikagaku Kougyou, Tokyo, Japan) with LPS prepared from E. coli 0111:B4 as a standard. The Ba/F3 cell line was obtained from the RIKEN Cell Bank (Tsukuba, Japan). 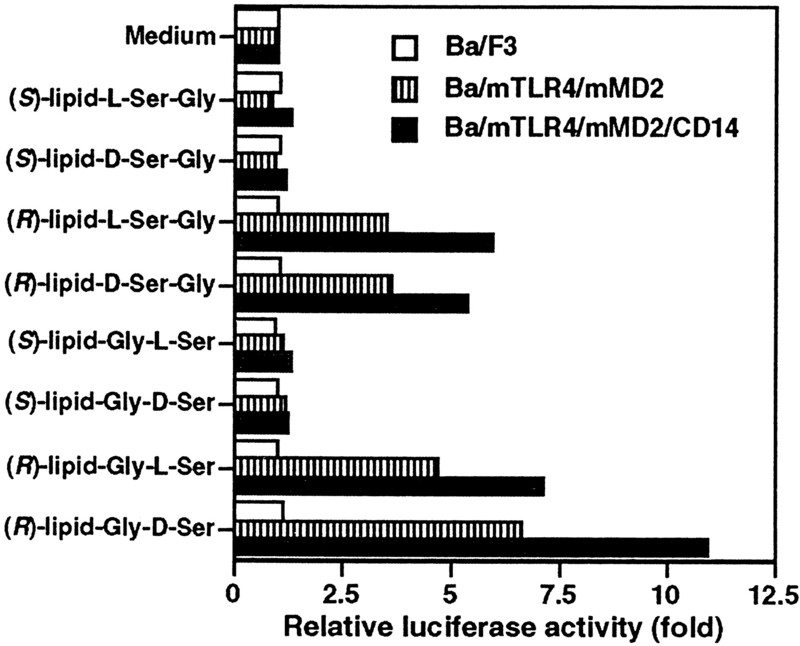 A Ba/F3 cell line stably expressing mouse TLR4 and p55Igκluc (20), an NF-κB-dependent luciferase reporter construct, was established previously (Ba/mTLR4) (23). A Ba/F3 cell line stably expressing mouse TLR4, mouse MD-2, and p55Igκluc was established previously (Ba/mTLR4/mMD2) (24). A Ba/F3 cell line stably expressing mutant mouse TLR4, from which the cytoplasmic region was deleted, and mouse MD-2 was also established previously (Ba/mTLR4Δ/mMD2) (24). A Ba/F3 cell line stably expressing p55Igκluc was generated as described previously (23). Mouse CD14 expression construct pcDL-SR-CD14 (26) was introduced into Ba/F3 cells expressing p55Igκluc and Ba/mTLR4/mMD2, and expression of mouse CD14 was confirmed by immunoblotting with anti-CD14 mAbs (named Ba/CD14 or Ba/mTLR4/mMD2/CD14, respectively). Ba/F3 and stable Ba/F3 transfectants were maintained as described previously (24). The p55Igκluc was introduced into RAW264.7 cells by electroporation, and then the cells were maintained in RPMI 1640 medium supplemented with 10% heat-inactivated (56°C for 30 min) FBS and antibiotics. J774.1 was maintained in Ham’s F-12 medium supplemented with 10% heat-inactivated FBS and antibiotics. 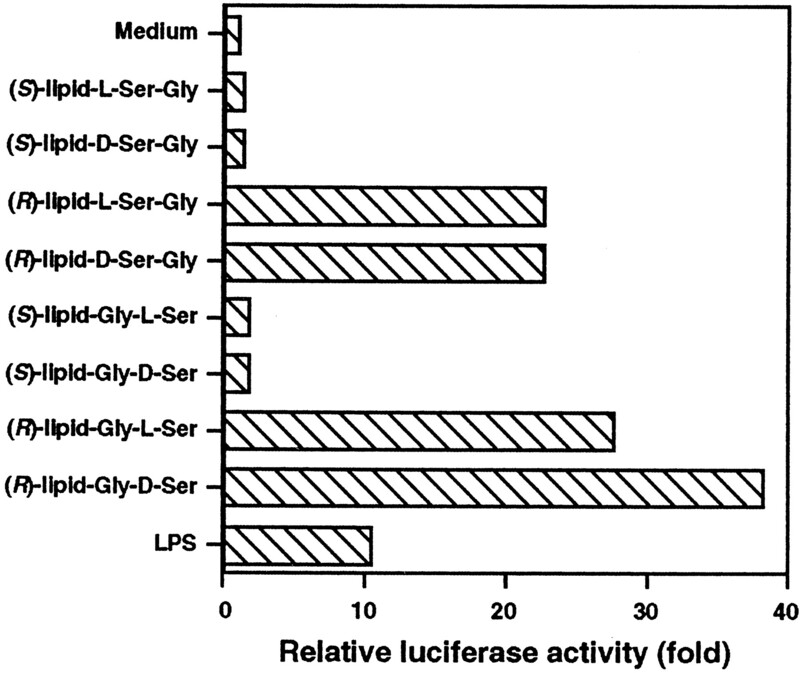 Luciferase activity in cell lysates was measured with a luciferase assay system (Promega, Madison, WI) as described previously (24). Genetic characterization of C3H/HeJ mice suggested that a point mutation in TLR4 affects flavolipin responsiveness in the mice (12, 27). It has remained undetermined whether or not TLR4 directly mediates flavolipin-induced signaling and whether or not MD-2, which associates with the extracellular portion of TLR4, is involved in the signaling. To determine whether or not TLR4 or the TLR4-MD-2 complex mediates flavolipin signaling, we examined flavolipin responsiveness by measuring NF-κB activation in a Ba/F3 stable transfectant expressing mouse TLR4, named Ba/mTLR4, and a Ba/F3 stable transfectant expressing both mouse TLR4 and mouse MD-2, named Ba/mTLR4/mMD2, by EMSA. As shown in Fig. 2⇓A, flavolipin evidently induced NF-κB activation in Ba/mTLR4/mMD2 cells. In contrast, under the same conditions, it did not induce NF-κB activation in Ba/F3 or Ba/mTLR4 cells. Similar results were obtained with LPS or Taxol stimulation. The requirement of coexpression of TLR4 and MD-2 for flavolipin responsiveness was confirmed by the NF-κB-dependent reporter assay (Fig. 3⇓A). Furthermore, we measured NF-κB activation by means of flavolipin stimulation in a Ba/F3 stable transfectant expressing both MD-2 and mutant TLR4 lacking the cytoplasmic portion, named Ba/mTLR4Δ/mMD2. As shown in Fig. 2⇓A, flavolipin did not induce NF-κB activation in Ba/mTLR4Δ/mMD2 cells, implying that the cytoplasmic portion of TLR4 is required for flavolipin signaling. These results, taken together, demonstrate that coexpression of TLR4 and MD-2 confers flavolipin responsiveness on Ba/F3 cells. Such a requirement for coexpression of TLR4 and MD-2 has also been reported in the case of the LPS (20) and Taxol (24) responsiveness of Ba/F3 cells, suggesting that the TLR4-MD-2 complex is a shared molecule in LPS, Taxol, and flavolipin signaling. The TLR4-MD-2 complex mediates flavolipin signaling. A, Total of 2 × 106 Ba/F3 (lanes 1–4), Ba/mTLR4 (lanes 5–8), Ba/mTLR4/mMD2 (lanes 9–12), or Ba/mTLR4Δ/mMD2 (lanes 13–16) cells were incubated at 37°C for 1 h in culture medium containing 0.001% TEA and 0.0025% DOC (lanes 1, 5, 9, and 13); 100 μg/ml flavolipin, 0.001% TEA, and 0.0025% DOC (lanes 2, 6, 10, and 14); 5 ng/ml LPS (lanes 3, 7, 11, and 15); or 10 μM Taxol (lanes 4, 8, 12, and 16). After incubation, nuclear extracts were prepared and subjected to EMSA to measure NF-κB activation as described previously (36 ). B, Ba/mTLR4/mMD2 cells were stimulated with the indicated concentrations of flavolipin or LPS, and NF-κB activation was measured as described for A. Expression of CD14 enhances flavolipin signaling. A, Ba/F3 cells with p55Igκluc introduced, and Ba/CD14, Ba/mTLR4, Ba/mTLR4/mMD2, and Ba/mTLR4/mMD2/CD14 cells (2 × 105 cells/500 μl of cell culture medium containing 0.002% TEA and 0.025% DOC in the wells of a 48-well dish (Costar, Cambridge, MA)) were exposed to the indicated concentrations of flavolipin. After stimulation at 37°C for 4 h, the cells were harvested and lysed in 50 μl of cell lysis reagent (Promega), and then luciferase activity was measured. Luciferase activity was normalized as to the activity in cells cultivated without flavolipin and is presented as fold induction. The data represent the averages for duplicate wells. B, Ba/mTLR4/mMD2 or Ba/mTLR4/mMD2/CD14 cells were stimulated with the indicated concentrations of flavolipin, LPS, or Taxol, and then NF-κB activation was measured by EMSA as described in Fig. 2⇑A. The results shown are representative of two independent experiments. C, The radioactivity of the NF-κB signal on EMSA (B) was determined with a bioimage analyzer, FUJIX BAS 2000 (Fuji Film, Tokyo, Japan). We used flavolipin prepared from F. meningosepticum in the experiments shown in Figs. 2⇑A and 3. LPS contamination of the flavolipin preparation was measured by means of Limulus test (28), with 8.56 pg of a test-positive substance being detected in 100 μg of the flavolipin preparation. A total of 50 μg/ml of the flavolipin, which contains 4.28 pg/ml of LPS at most, induced apparent NF-κB activation under the conditions under which 100 pg/ml of LPS did not induce activation (Fig. 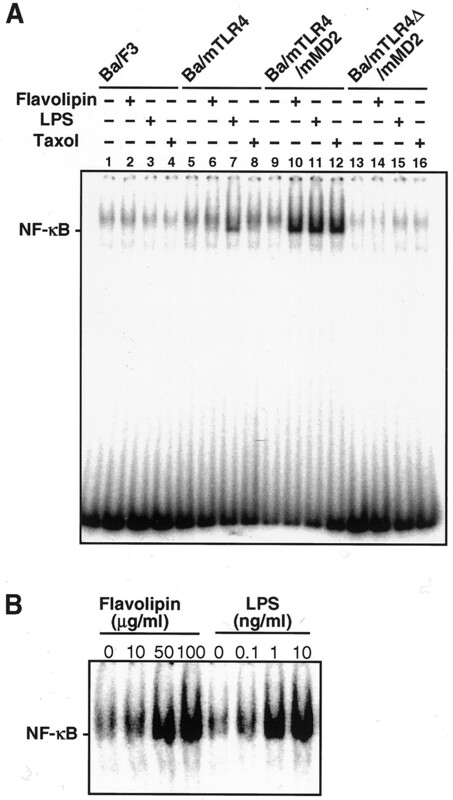 2⇑B), indicating that LPS contamination of the flavolipin preparation was not responsible for the ability to induce NF-κB activation. Furthermore, a chemically synthesized flavolipin ((R)-lipid-Gly-l-Ser) induced the signal via the TLR4-MD-2 complex, and this activity is (R)-isomer specific (see below; Fig. 5⇓). The experiments involving the chemically synthesized flavolipin provided definite evidence that flavolipin possesses the ability to induce signals via the TLR4-MD-2 complex. CD14, a GPI-linked plasma membrane protein, has been demonstrated to be an initial cell surface receptor for microbial components such as LPS, lipoarabinomannan, lipoprotein, and ornithine-containing lipids (29, 30, 31, 32). LPS binding to macrophage-like J774.1 cells is blocked on coincubation with flavolipin, suggesting that CD14 is also a receptor for flavolipin (32). To determine whether CD14 contributes to the flavolipin signaling via the TLR4-MD-2 complex, we compared the flavolipin responsiveness of Ba/mTLR4/mMD2 cells with that of Ba/mTLR4/mMD2 cells expressing mouse CD14 (Ba/mTLR4/mMD2/CD14). As shown in Fig. 3⇑A, the flavolipin-induced NF-κB-dependent reporter activation in Ba/mTLR4/mMD2/CD14 cells was apparently higher than that in Ba/mTLR4/mMD2 ones. Similar results were obtained on EMSA (Fig. 3⇑, B and C). These results suggest that CD14 is involved in the signaling events induced by flavolipin. Such an effect of CD14 has also been reported in the case of LPS-induced NF-κB activation (33) (Fig. 3⇑, B and C). However, in the case of Taxol signaling, expression of CD14 did not enhance NF-κB activation (Fig. 3⇑, B and C). This result is consistent with the previous finding that CD14 is not involved in LPS-mimetic Taxol signaling in a macrophage-like cell line (34). These results suggest that the requirement of CD14 expression for NF-κB activation differs among LPS, Taxol, and flavolipin stimulation, although the requirement of the TLR4-MD-2 complex is the same among these stimuli. To determine the essential moiety of flavolipin for the induction of immune responses, we chemically synthesized flavolipin stereoisomers (Fig. 4⇓). In addition to these flavolipin stereoisomers, we also synthesized stereoisomers of flavolipin analogs (R or S)-lipid-(l or d)-Ser-Gly and (R or S)-lipid-(l or d)-Ser. We examined the ability of these flavolipin stereoisomers and analogs to induce NF-κB activation via the TLR4-MD-2 complex. As shown in Fig. 5⇓, (R)-flavolipin, in which the stereochemistry of the lipid moiety is R, and (R)-analogs induced NF-κB activation in the cells expressing TLR4 and MD-2, but (S)-flavolipin and (S)-analogs did not. In contrast, the configuration at the serine residue and the amino acid sequence of the amino acid moiety did not affect the ability to induce NF-κB activation via the TLR4-MD-2 complex. These results demonstrate that the (R)-configuration of the flavolipin lipid moiety is important for the induction of signals via the TLR4-MD-2 complex and that the configuration at the serine residue and the amino acid sequence of the amino acid moiety are not important for induction of the signaling. Structures of the synthesized flavolipin and flavolipin stereoisomers. The structures of (R or S)-lipid-Gly-(l or d)-Ser are shown. Arrows indicate the asymmetric carbon atoms. The structure of F. meningosepticum flavolipin was previously determined to be (R)-lipid-Gly-l-Ser (2 ). The (R)-configuration of the flavolipin lipid moiety is important for signal induction via the TLR4-MD-2 complex. Ba/F3 cells with p55Igκluc introduced and Ba/mTLR4/mMD2 and Ba/mTLR4/mMD2/CD14 cells (4 × 104 cells/100 μl of cell culture medium containing 1% DMSO in the wells of a 96-well dish (Costar)) were stimulated without (medium) or with 50 μg/ml of the synthesized flavolipin ((R)-lipid-Gly-l-Ser), flavolipin stereoisomers ((R)-lipid-Gly-d-Ser and (S)-lipid-Gly-(d or l)-Ser), and flavolipin analogs ((R or S)-lipid-(d or l)-Ser-Gly). After stimulation at 37°C for 4 h, 25 μl of 5× cell lysis reagent (Promega) was added to the wells, and then luciferase activity was measured. Luciferase activity was normalized as to the activity in cells incubated without a stimulant and is presented as fold induction. The data represent the averages for duplicate wells. We examined whether or not the (R)-configuration of the flavolipin lipid moiety is important for the ability to activate macrophage-like cell lines RAW264.7 and J774.1. As shown in Fig. 6⇓, (R)-flavolipin and (R)-analogs induced NF-κB activation in RAW264.7 cells, but (S)-flavolipin and (S)-analogs did not. Furthermore, as shown in Table I⇓, (R)-flavolipin and (R)-analogs induced TNF-α production by J774.1 cells, but (S)-flavolipin and (S)-analogs did not. These results were similar with our previous finding that (R)-ornithine-containing lipid, in which the configuration of the lipid moiety is R, induced activation of J774.1 cells, but (S)-ornithine-containing lipid did not (5). These findings, taken together, suggest that the (R)-configuration of amino acid-containing lipids is important for the induction of cellular signaling in macrophages. Previously, Takeuchi et al. (35) demonstrated that the (R)-isoform of synthetic mycoplasmal lipopeptide macrophage-activating lipopeptide-2 was much more active than (S)-macrophage-activating lipopeptide-2 in macrophage stimulation and that the activating signal was mediated by TLR2. These results together with those described here suggest the importance of the stereo configuration in ligand recognition by TLRs. The (R)-configuration of the flavolipin lipid moiety is important for induction of NF-κB activation in RAW264.7 cells. RAW264.7 cells with p55Igκluc introduced (4 × 104 cells/100 μl of cell culture medium containing 1% DMSO in the wells of a 96-well dish) were stimulated without (medium) or with 50 μg/ml of the synthesized flavolipin, flavolipin stereoisomers, and flavolipin analogs, as described in Fig. 5⇑. Luciferase activity was measured and presented as in Fig. 5⇑. In this study, we showed that flavolipin responsiveness was acquired through the coexpression of TLR4 and MD-2 on Ba/F3 cells. In addition, we showed that the expression of CD14 enhances the flavolipin signaling mediated by the TLR4-MD-2 complex. Furthermore, we showed that the (R)-configuration of the lipid moiety of flavolipin is essential for the induction of the signaling mediated by the TLR4-MD-2 complex and that the configuration at the serine residue and the amino acid sequence of the amino acid moiety are not important for induction of the signaling. We thank Drs. K. Miyake and S. Akashi for the generous gifts of stable Ba/F3 transfectants (Ba/mTLR4, Ba/mTLR4/mMD2, and Ba/mTLR4Δ/mMD2). ↵1 This work was supported in part by Social Insurance Agency Contract Funds of the Japan Health Science Foundation; grants-in-aid from the Ministry of Education, Science, and Culture of Japan; a grant from Ichiro Kanehara Foundation; and Special Coordination Funds for Promoting Science and Technology from the Science and Technology Agency of Japan. ↵3 Abbreviations used in this paper: TLR, Toll-like receptor; TEA, triethylamine; DOC, deoxycholic acid; (R or S)-lipid-Gly-(l or d)-Ser, N-(R or S)-[3-(isopentadecanoyloxy)isoheptadecanoyl]-glycyl-(l or d)-serine; (R or S)-lipid-(l or d)-Ser-Gly, N-(R or S)-[3-(isopentadecanoyloxy)isoheptadecanoyl]-seryl-(l or d)-glycine; (R or S)-lipid-(l or d)-Ser, N-(R or S)-[3-(isopentadecanoyloxy)isoheptadecan]-(l or d)-serine.